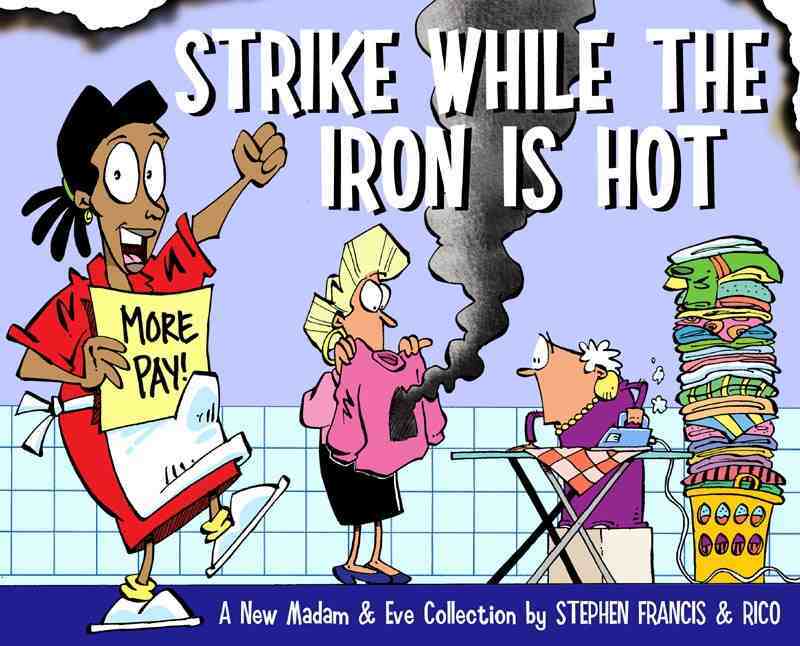 Why Do The Middle Classes In South Africa Pay Their Domestic Workers Such Low Wages? It’s written by a Human Rights graduate student at Columbia University in New York, with interests in women’s rights, youth and gender in Southern Africa. I don’t really want to turn this into a public naming-and-shaming – but I get seriously annoyed by this kind of article. We recently watched the Hewitt family give up their middle class Pretorian lifestyle for a month to live in Mamelodi and blog about it, and nothing changed. Shame on the middle class that can afford to pay their domestic workers more but don’t. An introduction to basic math: R150 per day – R20 per day transport = R130 per day ≠ a living wage. Even if the Department of Labour says it is, it obviously isn’t. True, the unemployment rate is 25.5% – but actually, forget that. Those kids that can pay more refuse to pay more, which is totes shocking! It actually makes me angry. Mainly because the main outcome of moralistic argument is passionate opposition from the people that you’re addressing. And when the main conclusion to your own question is “because the middle class can”, then you’ve not done the basic economics. Who sets the wages of domestic workers? Do domestic workers earn a fair wage? What, if anything, could make the system fairer? Domestic workers are a luxury good for the middle class. When the price goes up, that does not necessarily mean that there are fewer “jobs” available – it just means that the average household may reduce the number of times that the domestic worker comes in every week. When it comes to price negotiations, the middle class housewives probably do discuss it with each other. Likely in much the same way as the domestic workers discuss their daily rates amongst themselves. But “price” is more than just the daily wage. I mean, this is somewhat anecdotal (my sample size is the middle-class homes that I’ve spent time in), but the ladies that come in to clean usually get food provided for them on the days that they work, as well as first pick of all secondhand clothes, shoes, linen, appliances and furniture. The middle class also take on the risk of having someone in their homes. It may sound counter-intuitive, but I’d be willing to bet that this acts as a deterrent to hiring a domestic worker – unless it seems like a really good deal. Finally, labour laws make it very difficult to fire a live-in domestic worker. When it comes to having an unwanted worker around – being forced to keep them in your home feels like a violation of privacy. I think it explains why South African practice is to ask a char lady to come in once or twice a week, rather than hiring a permanent maid. The unemployment rate is 25.5%. As recent outbreaks of xenophobic violence have demonstrated, there is also large competition from foreign immigrants into South Africa. If the market practice is to hire char ladies on a day-by-day basis, then that doesn’t really allow for wage negotiation from a position of strength*. *Yes, I realise that’s probably why the practice is to hire on a day-by-day basis. Agreed: the situation seems “biased” against the domestic worker. But that’s like saying that the dating process is biased in favour of the beautiful. It’s not so much a societal injustice as an environmental one. The real risk is that this bias gets abused. I realise that the Human Rights graduate and I may differ on the term “abuse” here. For me, “abuse” implies the type of practice that is generally found in the Middle East; where domestic servants have their passports confiscated, and are generally enslaved in all but name. For the Human Rights graduate, perhaps the term “abuse” would also include wages of $15 per day. Is a wage of $15 per day a fair one? Assuming that a char lady elects to work 6 days a week, at $15 per day, she’ll earn around $360 (or R3,600) per month in direct cash salary. If we’re going to be fair about this, we should probably include the value of the meal that she gets each day that she works. Even if it’s nothing more than a loaf of bread, some jam, and a cup of tea (it’s rarely more than that), then we’re still talking in the region of around $1.50 (or R15) per day. Which works out to an extra $36 (or R360) every month. But putting that to the side for the moment, earning $15 per day is meaningless unless we know something about her expenses. I mean, we know that absolute poverty is generally measured by living on less than $1 per day, so she’s clearly living above that. But absolute poverty measures are a bit ridiculous: everything is relative after all. Fortunately, we have the experience of the Hewitts to draw on (the family mentioned above that moved to the Mamelodi township for a month). Here’s a link to their blog post on expenses. However, that budget did come in at less than what our char lady would spend. And as I’ve pointed out in two previous posts (Poor People Think Differently and Susus and Stokvels), and as demonstrated by the research in that awesome book “Poor Economics“, the poor have their own financial savings mechanisms for coping with the bigger expenses. 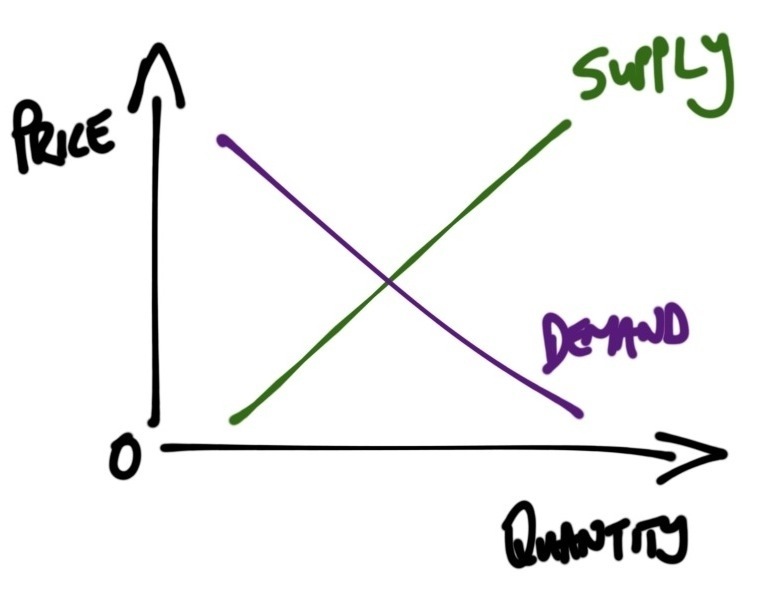 The demand for basic items is going to be driven by the budget lines of the people that demand them. $15 per day is in line with what non-domestic workers are earning. Like taxi drivers (minimum wage of between R1,700 and R2,500 per month). And waiters (minimum wage of between R2,200 and R2,500 per month). So domestic workers are not necessarily disadvantaged in their home markets where they are part of the demand curve. And sure – taxi drivers also earn commissions, and waiters earn tips. But domestic workers usually have access to the secondhand clothing and furniture. And given that charladies usually work in two to three homes at a time, their chances of monthly income-supplements-in-kind are high. 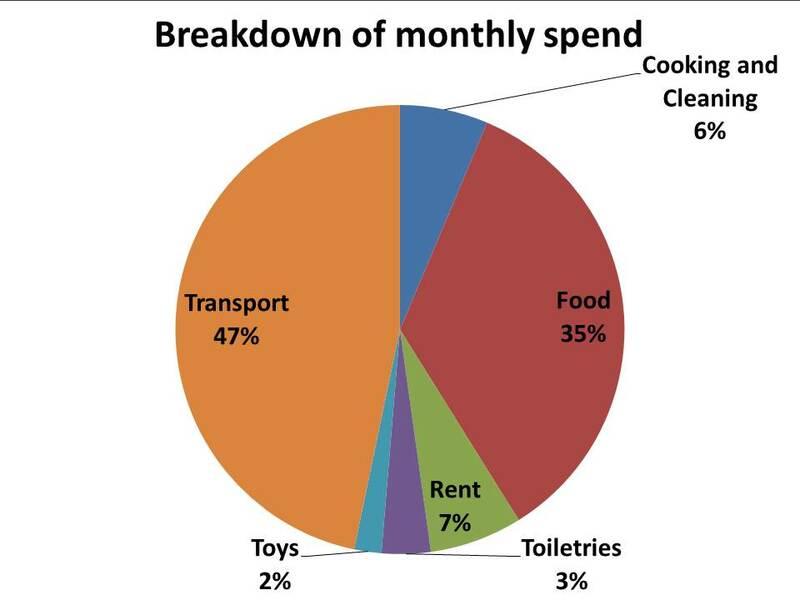 47% of the Hewitts’ budget was spent on transport. That is the part that should demand our attention. Because the South African middle class will spend a lot of time bemoaning the increase in fuel prices, and the imposition of eTolls on the highways – but they will never feel the impact like the charlady that needs to pay for a taxi ride to her place of work. Can I make a suggestion (this is the point where it can get ethical)? Perhaps the middle class should strip out the transport from the daily wages that they pay their domestic workers. This is a cost that is not related to the service that they receive. That is a cost worth covering. Even if all that one does is say “Let’s take out the $2 per day that you currently spend on transport, we’ll cover that, and we’ll guarantee you $13 per day.” Because that way, when transport costs increase, they don’t impact her actual take-home. While I appreciate your economic approach to this discussion, and possibly largely agree with your critique of the original piece, I’d like to raise a few issues with your analysis and ask a question. Firstly, in my (admittedly limited) experience “electing” to work 6 days a week may be difficult for most domestic workers here in SA. The 25.5% unemployment rate would suggest this, as would the assertion that wages are low because demand is higher than supply. Secondly, separating out transport costs will not protect take-home pay from increases of food, clothing, etc as producers and retailers respond to fuel prices increases. I accept that domestic workers have probably directly avoided the 35% electricity price increases we have experienced over the last two years as most shack dwellings (such as the one inhabited by the Hewitts) don’t have access to electricity, but these too have added to all other prices. Thirdly, as well as leaving out school fees, the Hewitts budget did not include nursery care costs. These are not “bigger expenses”, these are daily costs associated with either accessing employment or wanting to meet the basic needs of your children to have the opportunity to improve their livelihoods. The original post made you angry and in some respect your response upset me. Because whilst the economics might seem sound (given full employment at the individual level), it still leaves little room for improvement of livelihoods. The cleaner still lives in a shack, still can not access electricity and may not be able to provide the prerequisites for his/her children to access education effectively. Even arguing from an economic perspective this means that this is a section of society that is unable to drive domestic demand and consumption, nor that can help ameliorate the negative domestic savings situation in SA and of course the economy may not optimally benefit from the innovative/productive capacities of their children. But at the end of the day, despite all the sound economic analysis, if the cleaner were your grandmother, would you think it fair (20 years after the end of Apartheid) that she must still work 6 days per week just to survive? Thanks so much for your response – I really appreciate it when I get such a detailed comment. Firstly, I agree that high unemployment makes it difficult to “elect” to work 6 days a week, so my choice of language was wrong. That said, when we look at whether or not this is a living wage, we have start with the assumption that you would get to earn the daily wage as if you were working full-time. I don’t think you can expect the daily wage to adjust so that someone is paid more because they can only work for fewer days in the week. It’s just not feasible – you’d end up with even higher unemployment. Secondly, with respect to your point about increases in other living costs: I’m not aiming to find a perfect solution. I don’t believe that there is one – and I certainly don’t believe that there is one that will be accepted by the middle class. 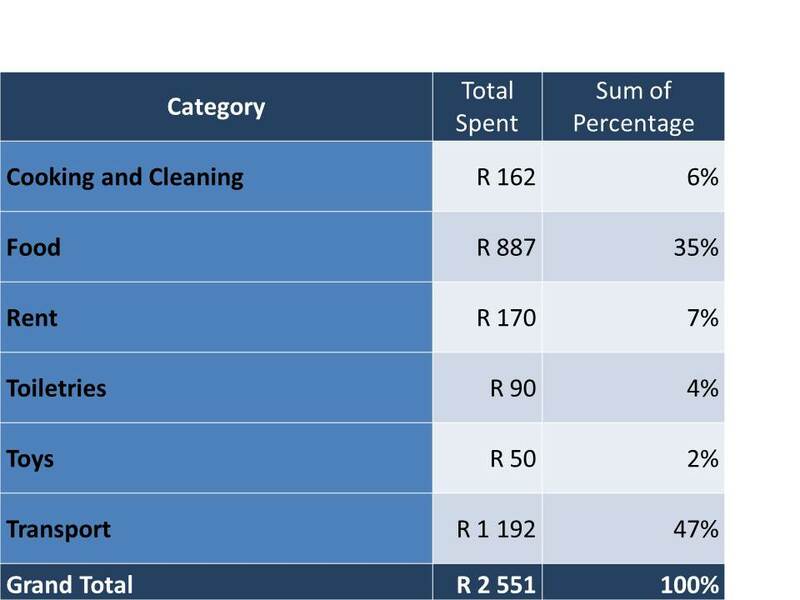 However, given the unreasonable weighting of transport in the budget of the Hewitts, can you agree that a domestic worker would be better off if shifting costs of transport were not something that they had to shoulder? I think that there is a good chance that the average middle class household would accept this burden shift – especially if it costs them nothing (at this point) to split out the transport expense from the daily wage. I also hear your point on nursery care costs, and agree that this is a daily expense. My understanding is that the current social welfare system in South Africa offers a childcare grant to low income workers (currently – R280 per child per month, I think?). But again – I acknowledge that there is no good solution. Finally, with respect to your question about how I would feel if it were my grandmother that were the cleaner, I’ll be honest and say “not good”. But I’m also concerned by the implication that I must be callous toward plight of domestic workers because I have no personal involvement. I don’t believe that is true. Can I fully appreciate what it is like to live in a shack? No – no I cannot. In the same way that I cannot understand what it is like for a mother to watch her child die of cancer. But I can empathise. And I can do what I can to make the situation easier. I think that my point is this: we talk about disadvantage and low remuneration as though they are the deliberate actions of a greedy and ruthless upper class. But in general, they are not. They are just generally unfortunate and unfair. Like death is not always at the hands of a murderer – it’s usually just an accident, or being in the wrong place at the wrong time, or bad genetics, or old age. Maybe that’s an overly dramatic comparison – but death is one of those things that we just have to accept as a fact of life. We don’t aim to eradicate it – we respond to it by seeking to prolong life and ease suffering. I think inequality needs the same response. We cannot eradicate; but we can alleviate. We can provide social grants, and make small changes to the way we do things. Sometimes, the occasion arises where we can do a bit more (like pay a child’s school fees, or put our domestic workers on medical aid, or help them with loans to build a house – all of which I have seen middle class families do). But outright condemnation of the middle class as though it is their fault creates division and resentment. And I just don’t believe that is productive. I hope you don’t mind me coming back again. With regard to daily rates, we already do have well functioning employment markets that allow those employed to charge a higher daily rate than the normal market rate for the job based on the notion that they may not obtain full time equivalent employment (or indeed holiday pay and other benefits), but we call them consultants. It is valid that increasing wages may lead to reduced employment, but I would argue that the income disparities between the employers and the employed (SA had an income GINI coefficient of 0.7 in 2008) in this context are so great, that to add as little as R100 per day (about the price of lunch and a coffee in Cape Town CBD) would barely dent the pocket of the former, but have a substantial marginal utility effect to the latter. I also want to apologise for personalising my response. As soon as I submitted, I realised that I was unfair to ask the question about your Grandmother. I am usually mindful not to personalise an argument. In the same way that you perceived the original piece as an outright condemnation of the middle class (I did not read it as so absolute), I found your response to be without any acknowledgement of the plight of those who have to live on such low wages and at times it seemed insensitive. I doubt there are many South Africans in more formal employment, who would consider the first pick of their bosses discarded clothing as a meaningful perk of the job. Unfortunately we will have to agree to disagree on your final point. To me, income inequality is not analogous with accidents. Whilst it may be impossible to completely eradicate inequality, it is possible to reduce it, perhaps but considering people over profits. I am neither a communist nor a conspiracist, but the way we choose to distribute wealth (a man made concept) is down to the economic and political systems we choose to employ. In this regard low remuneration and disadvantage are, I believe, largely deliberate – not always at the individual level, but certainly structurally. As your earlier posting on global wealth inequality suggests, the current global neo-liberal doctrine appears to exacerbate income inequality in the long run. I might be missing something glaringly obvious, but would $15 a day, six days a week be $360 a month in direct cash earnings? Also, I’d love for the American who wrote that article to see this and hear what she thinks. Nick! You are so right. I’m amending it – thanks for pointing it out! I’m from the UK (live in CT) and each time my family visit they also feel the need to vocalise their thoughts on how terrible it is that we pay our nanny and cleaner so little. Our cleaner is paid R3200 and our nanny R4000. On top of this they both receive 3 meals a day and I pay their BIS so they have free whatsapp etc. I gave each of them a new blackberry and they are on the receiving end of all our children’s (and our) clothes and belongings – which with 4 children amounts to quite a lot. Oh and the nanny lives in so has no travelling expenses. Both of them have taken more than the allotted holidays and sick days and they both work 8 hours a day with the correct breaks. Everything I do follows the book to a T.
Now, let’s put the wages up… I would have to let one of them go immediately (probably the cleaner) as we wouldn’t be able to afford both and I would probably cut down on the meals in the evening as she would now have enough money to buy her own. (And on average that costs me an extra R30 a day). Our nanny has already admitted to me that with her wages she is able to save R2000 a month to send home to her extended family. She earns more, with more privileges, than most au pairs in Europe. To be honest, I’m a little tired of hearing how hard they work and how little we pay when I see how much they really get in extras. I look at my “middle class” friend who takes home R10 000 a month and once she’s paid the rent on her studio, fed herself, clothed herself and paid for her own phone and transport she tells me there is nothing left. My cleaner hasn’t turned up for the last week… the last I heard she had back pains but even though I can see she is active on whatsapp throughout the day, she doesn’t feel it necessary to reply to my message asking when she will be back at work (it’s been 5 days now). I realise that I’ve replied to this post at a bad time but to say that I am over the judgement of others who have no real idea of our side (let’s call us the middle class hey) – the constant lending of money, paying out for everything, providing food all day, letting them go weekly (with no notice at all) to clinics, Drs, schools… the list continues and then to have absolutely no feedback on when they’ll be back at work. Well… if someone earning R10 000 or R20 000 a month ever acted like this, they would be fired. Oh and before I am lambasted for ‘generalising’, I’ll add that this is our 2nd nanny – our first contracted MDR TB and hid it from us for months whilst feeding and kissing and hugging my 2 year old so we had to potentially damage his liver by giving him anti-TB drugs for 3 months and also our 2nd cleaner because the first left the pool gate open and the kitchen chemicals out over the weekend and my son ingested them. I luckily caught him before he wandered into the pool. Sorry for the rant – but a little bit over the high and mighty attitude of people telling us how badly we treat domestics when in fact I feel that it is US who are badly treated by them. An ‘over it’ “middle class” housewife.